If you want to use floating licenses with a local server, follow these instructions. If necessary, contact your IT department for assistance. 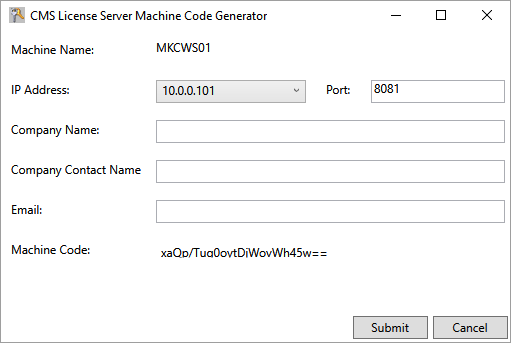 Download the CMS Machine Code Generator. Run the file on the computer that will be used as the Licence Server. The Machine Code, Name, and IP Address will be displayed. Click Submit to notify our Software Licensing Department. We will reply with further instructions within one business day. cmsGenLicServer.exe may be deleted when you receive the confirmation email from sales@camansol.com.